The great shoemakers strike of 1860 began with 3,000 Lynn, Mass., shoe workers who deliberately chose George Washington's birthday to start their righteous rebellion. Shoe workers march during the shoemakers strike. Tens of thousands would soon join them in the struggle for a living wage. Within a week the strike spread to 25 New England shoe towns, as 20,000 shoe workers walked off the job. Another 20,000 supporters marched in parades, came to rallies and jeered the out-of-town police. I am glad to see that a system of labor prevails in New England Under which laborers can strike when they want to, where they are not obliged to labor whether you pay them or not. I like a system which lets a man quit when he wants to, and wish it might prevail everywhere. By the end of the shoemakers strike, shoe workers would claim a partial victory, and their newly formed unions would live on to fight another day. The New England shoemakers strike had been brewing for years. Shoe workers had traditionally worked as fishermen and farmers. They made shoes at home to supplement their incomes. Men shaped the leather and their wives and daughters sewed uppers to soles. Eventually, demand for shoes increased, and employers centralized production in factories. By 1850, Lynn produced 4.5 million shoes a year. In 1852, the Lynn factories introduced Singer sewing machines. Consequently, boys and girls could do the work previously done by skilled adult artisans. The children worked for 10 exhausting, dangerous hours a day. Then the financial panic of 1857 sent the country into a long depression. Shoe workers lost their jobs and ran up heavy debts. When their employers rehired them the next year, they cut the workers' wages and lengthened their hours. For 16-hour days, men earned $3 a week, women only $1. It wasn’t enough to support a family, let alone repay debt. Of the 50,000 journeymen shoe workers in Massachusetts, only Lynners had organized a union by 1860. They formed the Mechanics Association in 1859, led by Alonzo Draper, a married 24-year-old law student. Draper also edited the paper, the New England Mechanic. The union members elected James Dillon, a 35-year-old Englishman, as vice president. Napoleon Wood, another leader, was a Methodist minister who often said the struggle for decent living standards didn’t conflict with his religious beliefs. Lyceum Hall, where the shoemakers strike began. 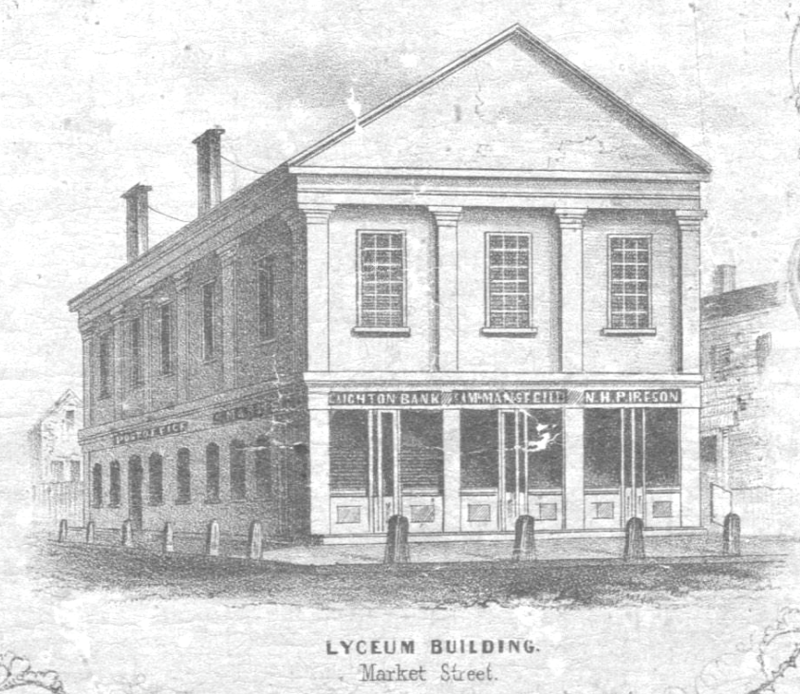 In early February, the Mechanics Association held a mass meeting at Lyceum Hall in Lynn to decide on a plan. They appointed committees to meet with employers, and they wrote a circular stating their demand for higher wages. The employers refused to meet with the workers. 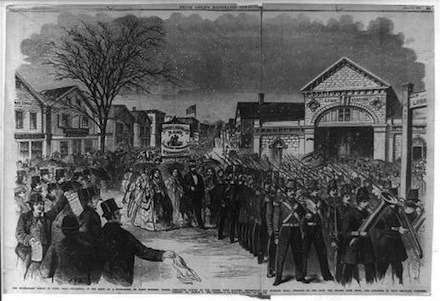 And so they walked off the job on Washington’s birthday because it was a ‘fitting day for a blow in favor of the cause you engage in.’ Reporters covered the mass meeting at Lyceum Hall in Lynn on Feb. 22, 1860, calling it the ‘largest and most enthusiastic of its kind ever held in New England.’ The workers set up committees of 100 men each to post the names of scabs, to keep order and to make sure shoes wouldn’t be finished elsewhere. They then marched to their factories and handed in their tools. That same day, several hundred shoe workers in Natick met. They decided to strike and marched through the streets singing a song to the tune of Yankee Doodle. Starvation looks us in the face. We cannot work so low. Such prices are a sore disgrace. Ten days later, workers marched in another procession in Lynn. It was two miles long, with 10,000 workers from North Shore shoe towns, two companies of infantry from Lynn and Marblehead and several fire departments. Thousands lined the street to watch the parade, including school children who got the day off. Lincoln supported the shoemakers strike. There was no rowdyism, and the strike leaders strongly discouraged alcohol. The strikers enjoyed community support, with businessmen contributing money and groceries and clergy denouncing the employers from their pulpits. When Boston police arrived at the train station, a crowd of 8,000 people jeered and hissed at them. The employers were ready to raise wages by the second week of the shoemakers strike, but refused to recognize the union. On April 10, a thousand Lynn workers went back on the job after 30 employers agreed to raise wages by 10 percent. Some held out for a few weeks longer, but the shoemakers strike had ended. The women had already gone back to work. Though the men supported them, they didn’t include the women’s wage demands in their proposals. They were concerned the employers wouldn’t consider their demands if they added the women’s. Alonzo Draper would become a general for the Union Army in the Civil War and die from a stray bullet at 29. With thanks to History of the Labor Movement in the United States: Volume One From Colonial Times to the Founding of the American Federation of Labor by Philip Sheldon Foner. This story about the shoemakers strike was updated in 2019. This should open the eyes of people who fight the unions.